Whether you’re new to cycling, a regular cyclist who hits the road every weekend, or an athlete who is ready to check off “century ride” from your bucket list, the V Foundation’s Victory Ride has a route to fit your skills. And to help select the distance that’s right for you, check out the route maps, elevation gains and other details! On May 19, we will gather to ride in support of cancer research. The V Foundation’s Victory Ride to Cure Cancer offers multiple routes to choose from. No matter the route, the goal is the same: ride to support the most promising cancer researchers. All routes will begin at NC State’s Centennial Campus, but the 30-, 60- and 100-mile routes will all be different. 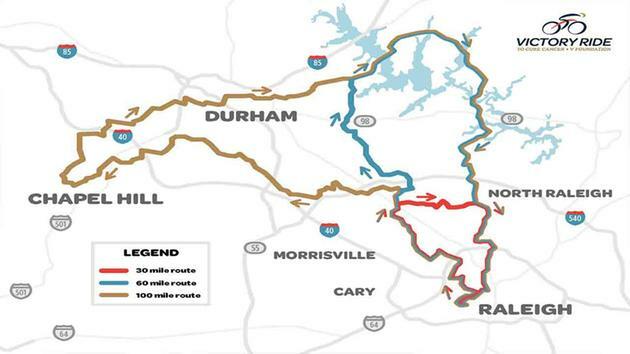 Depending on the route, riders could explore the streets of the Research Triangle Park, Chapel Hill, Durham, Falls Lake Recreation Area, and other neighborhoods in North Raleigh. All routes will finish back at Centennial Campus for a post-ride celebration featuring food and music. The routes were announced on ABC 11, the official TV partner of The Victory Ride. Additional detail on the routes can be found on the Ride’s website. There will also be a 1-mile family ride designed for participants of any age or skill level, who wish to join the fun, but at a much shorter distance. The family ride will be on a closed course within the NC State Centennial Campus. Live far away? Group riding not your thing? There is even a virtual ride for those unable to be in Raleigh on May 19 to join us to support cancer research. No matter which distance you choose to ride this May, we all will be riding together towards victory over cancer. Sign up today!